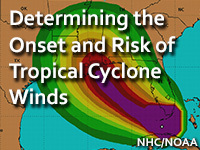 This lesson introduces forecasters to the probabilistic guidance products used by the National Hurricane Center to assess tropical cyclone wind threats. It provides an overview of how these probabilistic wind speed products are created, their purposes, and how to interpret them. The lesson also provides practice in determining the total risk and timing for location-specific peak wind events. This module would be better if the products were separated for learning the material. The combination of products throughout the module made it difficult to follow. Quickly learned the lesson, and passed the subsequent quiz. I liked the application problems in the quiz. However with some questions the answer choices were to similar to support any true value towards what was being asked. After my experience with Hurricane Irma and discussions with my meteorologist co-worker, I became a lot more aware of what the cone of uncertainty meant and wind predictions especially for my area where or when I had to assure that my amateur radio antennas would be least impacted. I thoroughly enjoyed this module. Explain how TC wind speed probability products account for forecast uncertainty. Identify the four TC wind speed probability products that are available. Explain how TC track, intensity, and size uncertainties are incorporated in the creation of TC wind speed probabilities. Explain how TC wind speed probability products are created. Identify the additional information that TC wind speed probabilities provide when compared with the cone of uncertainty. Determine whether to use onset or cumulative wind speed probabilities when addressing customer-specific needs. Determine the most likely and earliest reasonable time of onset for peak TC winds for any location. wind speed probabilities, text product, hurricane-force winds, tropical-storm-force winds, strong tropical-storm-force winds, tropical cyclone, onset, cumulative, risk, cone of uncertainty, earliest reasonable time of arrival, most likely time of arrival, time of arrival, GFE, gfe, forecast uncertainty. July 24, 2018: A majority of the case studies in the module have been updated to reflect the advancements made in the cone of uncertainty. Also, a section on two new forecast products has been added into the module (Time of Arrival graphics) to reflect the current state of tropical cyclone winds forecasting and information used by decision-makers to assess community risk. Learning objectives and keywords are updated.